I am having my WS32 painted top and bottom. I am stripping all of the deck hardware off and one of the things I would like to address while I have it torn apart is the hull to deck joint. I have suspected for years that mine leaks and I am curious what the best method would be to seal it up. I personally like the idea of filling the gap with epoxy and chopped mat and then a few layers of glass over that all faired in. I might even replace the teak cap rail with a fiberglass set up like that on Konami. Anyway, any comments or input on hull to deck joint and cap rail improvements would be welcome. Thanks for the note Norm. I think I will be keeping it so I am really getting myself talked into glassing over the joint. If I do I will make one modification from what they did on Konami. I will glass it in the same manner but split a piece of 1" solid rod down the middle and glue it on either side of the bulwark to emulate the "cap". I will overlap the last layer of roving over these and fair it all out. This way I don't need to actually mess with cap rails at all and the rod can be epoxied on in such a manner that I will achieve a nice fair line to the eye. I would glass on fiberglass stanchion bases and the jib car track so there are no through bolts. Anyway, still noodling over it and I will share more details when I get the caps off and see what I am faced with. I just reread your response and I think we share a similar approach to adding some sort of half round along the sides of bulwark to at least pay homage to the original look of the cap. You mention doing it with rope whereas I would like to use a piece of split glass rod but I have not priced it out. I don't have the caps off yet but one area that looks like it might pose an issue with my half round approach is where the bulwark sweeps down to the deck at the ends. There may not be enough room on the inboard side to run the rod along there so it might have to terminate and fair into the deck somehow for those areas. Again, once I get the caps off I will have a better idea of what I can do. Still pulling up the teak decks, hatches and deck hardware. 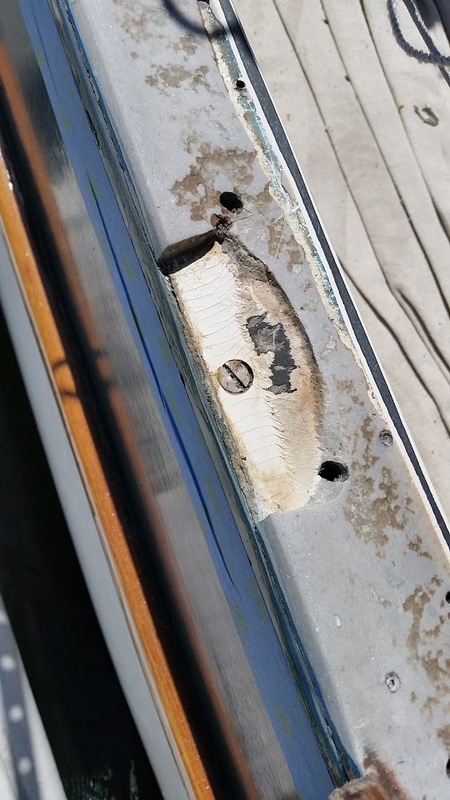 Please review Westsail Fixes & FAQ the first topic - I've been collecting information for several years on fixing the caprail leaks and will soon be adding more from a project on Randy Leasure W32 last month. I can only recommend to close the deck and hull joint with epoxy/glass seal - the sealents eventualy break loose from the joint. If you don't put the caprails back on - that is even better as the screws that hold the caprail in place are just another set of holes to allow the water in. The jib track bolts also are also a source of leaks. Thanks Jay. Yeah, I want to glass on as much as I can to avoid screws and bolts. Stanchion bases, light duty pad eyes, car tracks, etc, whenever possible. This holds true for other deck hardware where I can figure out a way to do it at reasonable expense. One of the things I even gave consideration was to eliminate the chain plates entirely and just put reinforced holes through the bulwark (like the hawser ports) and then go all Dyneema standing rigging but I don't know, seems like a lot of effort. It would be fun though. The link is part of the full membership pages - that is probably the issue. Here is what we found under Tortuga's caprail. I think this is bondo used to fill in the void and provide a level surface for the caprail. Note that it has cracked and the loose pieces removed. The area was repaired with thickened epoxy then caped with fiberglass and more thickened epoxy. All the "bondo" was NOT removed - the owners choice. Thanks for the photo. I am anxious to see what lurks beneath the teak. I am researching some alternate caprail materials right now like HDPE and the stuff they make commercial rubrails out of in case I want to put a traditional cap back on instead of building it up from glass. One advantage of replacing the caprail with something is that you could save some labor on the fiberglass joint work as the finish would not need to be quite as nice since it will be covered. Thanks for taking the time to post the detail Norm. I agree that I don't want to drill screws through the bulwarks but I have a possible solution for that that does not require actually bonding whatever material I use to the boat. Its complicated to explain and if I go this route I'll make sure to detail it for others.